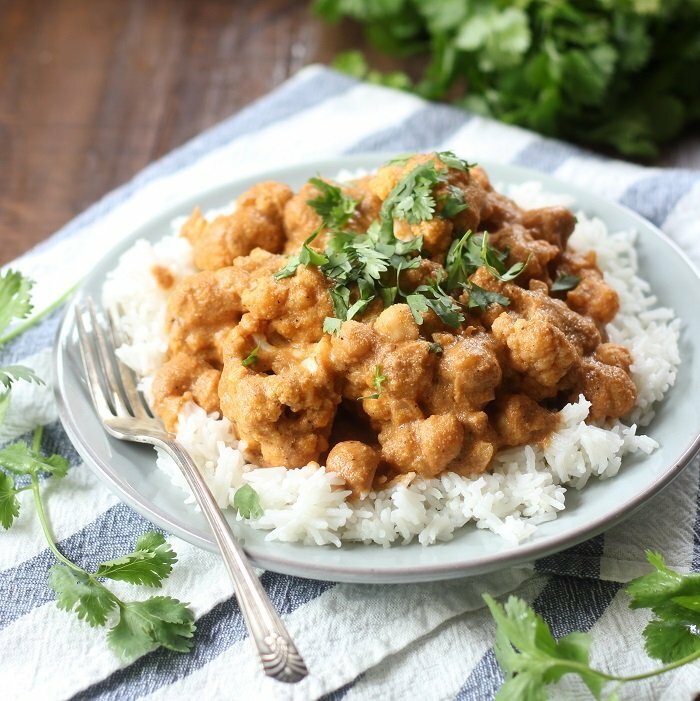 It took a while before I ever learned about tikka masala, I suppose because usually shows up on restaurant menus as chicken tikka masala, which isn’t really that interesting to me. So even when I did learn of the dish’s existence, I never got to try it, with the whole chicken and dairy issues to contend with. 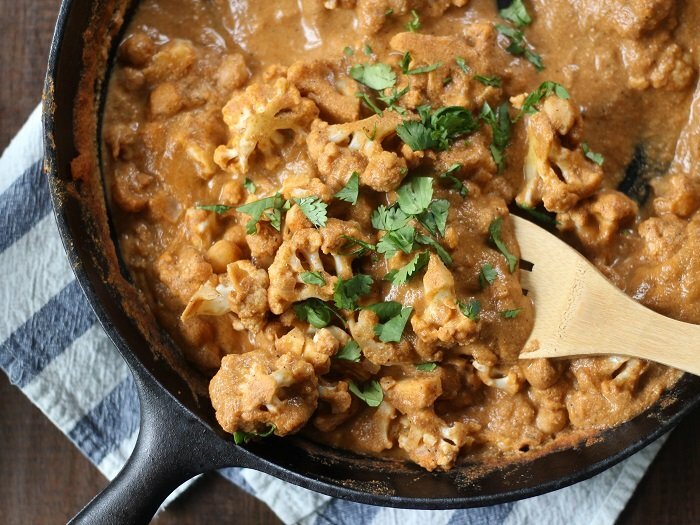 Really though, it would be such a shame to miss out on something like tikka masala. If you’re where I was not too long ago and know little of this dish, here’s the lowdown: rich, spicy, curry, tomato gravy. That’s it. It’s so good. I finally got down to it and created my own version. My very own vegan tikka masala. No need for chicken. Cauliflower is the meatiest of veggies and chickpeas the meatiest legume. I threw ’em both in there. Nor is there any need for dairy. 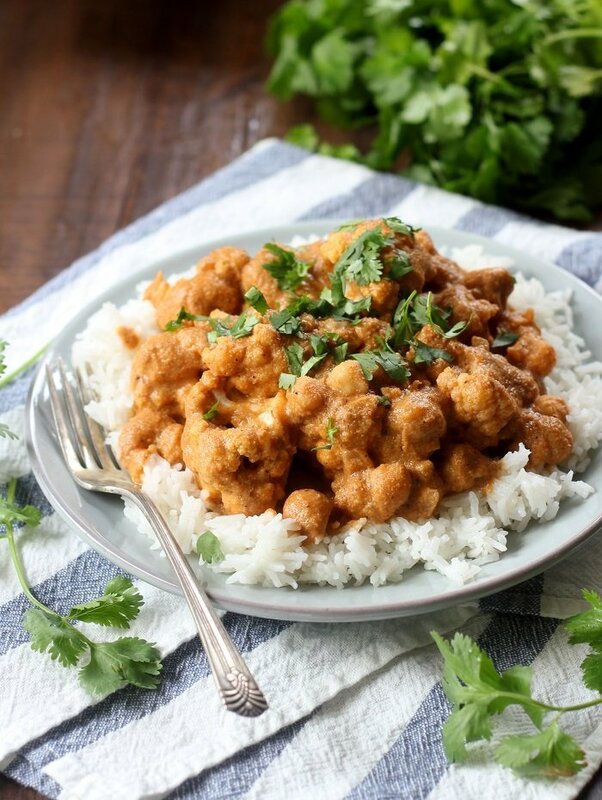 Traditional tikka masala is made with yogurt or heavy cream. Sounds tough to replicaet, but it’s really not. I’ve said it before and I’ll say it again: cashews are magic. They’re amazing, and so was this dish. My husband declared that he forgot he was eating vegan as he polished this off. You might just do the same. Coat the bottom of a large pot or skillet with oil and place over medium heat. Add onion and sauté until softened, about 5 minutes. Add cashew mixture, cauliflower, chickpeas, brown sugar and about 1/2 cup of water. Stir to incorporate. Bring to a simmer. Lower heat and allow to simmer, uncovered, until cauliflower is tender, about 12 minutes, stirring occasionally and thinning with a bit of extra water if needed. Divide onto plates with basmati rice. Top with cilantro. Serve. Looks delicious. Feeling like having it now. But anyway, I am going to prepare this soon as you have shown me the way. So, Thanks. I love how you just make the sauce in the food processor – looks so easy! 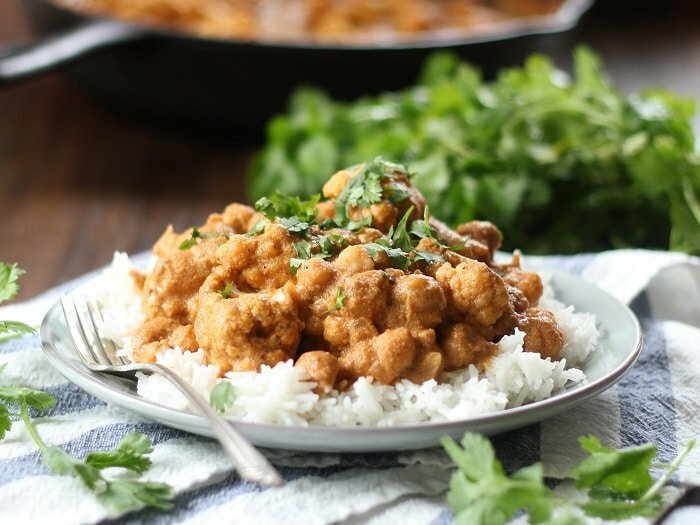 Tikka masala is my favorite Indian dish. I’ve made it with chicken and a vegan version with chickpeas, but I love how you combined cauliflower and chickpeas! I made this tonight and hesitate to comment since I did not have cashews and used homemade coconut milk instead along with subtracting the other liquids in the recipe. But I do comment because it was wonderful and actually tasted like tikka masala! Served it over brown jasmine rice. I hope to make it again with raw cashews instead if my grocery store isn’t out of them next time! Do you have any nutritional information for this recipe? It looks delicious! Thank you! I don’t usually calculate nutritional info for my recipes, but you can use this calculator if you’d like to. Can I sub apple cider vinegar for the lemon juice? You can give it a try, but you might get a bit of apple flavor in there. I always find apple cider vinegar to have a really distinct flavor. You might be better off trying a more neutral flavored vinegar. Made this tonight – and clearly should have opted for the mid-range of the chili paste. :-) I speed-soaked by cashews by cooking them in my Instant Pot for two minutes since I had forgotten to soak them. Worked well. I also added a little bit more agave syrup to make it a notch more balanced in flavors. My husband is not a big cauliflower fan, but he ate it and had seconds. The cauliflower was rather large (used ready to go florets from Trader Joe’s), and they weren’t cooked at the 12 minute mark. You may have to account for that in your timing. It was very delicious – thank you! I have never commented on a recipe in my life but I just had to tell you that this was the most delicious curry I have ever cooked and I’m not vegan! I used a packet of salted cashews from 711 and by the time they were soaked it was fine. Like another poster I added too much paste I think as the flavour was overwhelming and I was a bit worried. But I added some extra water and a bit of coconut milk and while this added to the cooking time considerably due to the extra liquid it was absolutely perfect when done. Thank you! The recipe uses cashews but talks about garbanzo beans. Which one do we use? I came across this recipe on Pinterest, made my first vegan meal and I love it.Thank you!